This past weekend I read one of the most important medical research articles of the year. “Without healing, multicellular life on Earth would not exist. Without healing, one injury predisposes to another, leading to disability, chronic disease, accelerated aging, and death” (Naviaux, 2018). Much of modern Western medicine is based on the principles of acute interventions for poisoning, physical injury, or infection. These principles trace to historical figures like Paracelsus (1493–1541), Ambroise Paré (1510–1590), and Louis Pasteur (1822–1895). These acute care interventions are now widely used in the modern fields of pharmacology, toxicology, urgent care, emergency medicine, and surgery. When treating acute disruptions in health [such as a cancerous tumor], the careful identification of the trigger, or cause of the problem, and the anatomical location of the defect, is an important part of good medical care. 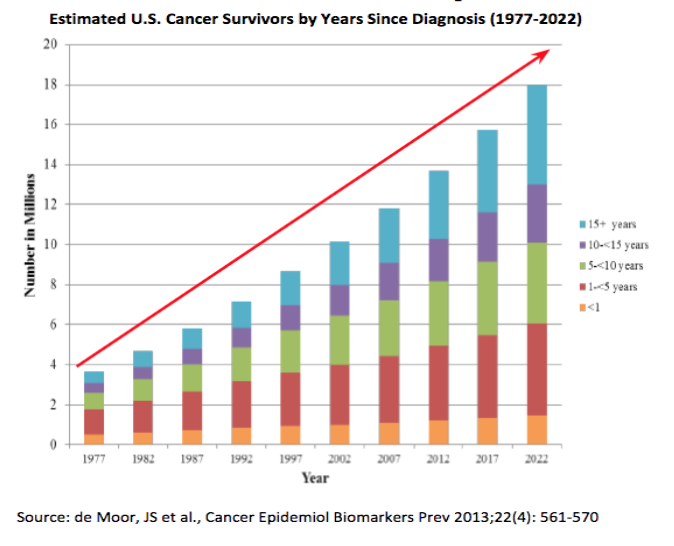 Significant investments in cancer research have resulted in a dramatic increase in the number of patients surviving their cancer diagnosis (below). Utah oncology clinics are applying research to quality cancer treatment through immunotherapy, chemotherapy, surgery, and radiation. As a result of this research, cancer is now considered a chronic disease, and will soon be the leading cause of death in the United States (Centers for Disease Control and Prevention, 2018). However, the rapid growth of individuals surviving their cancer diagnosis, has resulted in suboptimal integrative care during and after cancer treatment. According to the National Cancer Institute, this situation has created an urgent need for strategies that address cancer survivorship (2014). ﻿Indeed, cancer patients and cancer survivors need access and availability to affordable resources that makes it easy to learn, practice, and adopt a complete healing approach. However, in Utah, there is a critical gap in access and availability to affordable integrative cancer survivorship care. To fill this gap, the Cancer Wellness House has established strategic partnerships with each of the oncology groups in Utah. Through referrals from these partners, the Cancer Wellness House delivers free and reduced cost evidence-based health and wellness services to cancer patients, cancer survivors, caregivers, and family members. These programs and services provide an increased sense of community, significantly improved quality of life, and hope (National Institutes of Health, National Cancer Institute). What keeps hope alive? A reflection from Survivors at the Summit.